"This is a deliciously light, creamy, sophisticated little dessert from days gone by. I first tasted it at a supper given by a lecturer in seventeenth-century literature when I was at college, and it took our tastebuds right back to the Restoration. 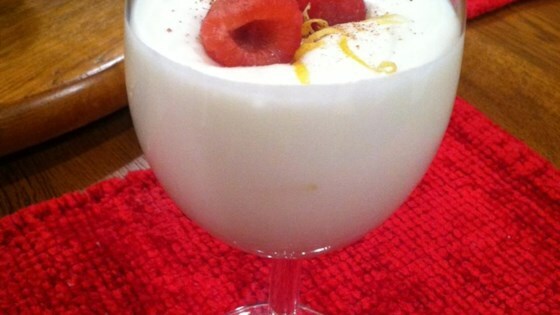 It can be prepared as either a parfait or a punch--please note that either version contains alcohol, so you may not want to serve this to younger family members." Whip the cream and sugar in a chilled bowl, until the cream begins to thicken. Gradually whip in the white wine, lemon juice, and lemon zest. Continue to whip until light and fluffy, but not grainy. Cover the mixture and chill until serving time. For syllabub punch, continue to add white wine to the whipped mixture, until the mixture reaches a drinking consistency. Didn't like it. Probably just my own palate not appreciating the pairing of cream and wine. Chilled is the way to go. Note: starts to separate after a day but can be re-whipped. This has been very popular with guests. I love to serve it when I cook seafood. I pair it with lemon curd, either swirled or layred. Very nice. I looked like a star when I brought this for a light unique dessert. Easy & wonderful over berries, decorated with flowers from my garden & lemon peel swirls. Easy to make, and is so simple. Wonderful tasting too, one has to enjoy a fattening dessert every so often!! Light and delicious as well as being quick and easy to prepare. Makes a great alternative to a Sabayon/Zambaglioni for a dinner party, since it is made in advance.